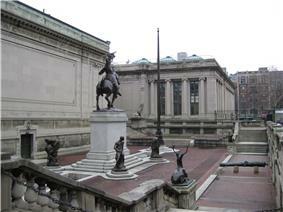 Grounds of the Hispanic Society of America, with an equestrian statue of El Cid. The Hispanic Society of America is a museum and reference library for the study of the arts and cultures of Spain, Portugal, and Latin America. (Despite the name and the founder's intention, it has never functioned as a learned association.) Founded in 1904 by Archer M. Huntington, the institution is free and open to the public at its original location in a Beaux Arts building on Audubon Terrace (at 155th Street and Broadway) in the lower Washington Heights area of New York City in the United States. The campus was designated a National Historic Landmark in 2012. Exterior sculpture at the Society includes work by Anna Hyatt Huntington and nine major reliefs by the Swiss-American sculptor Berthold Nebel, a commission that took ten years to complete. The museum contains works by Diego Velázquez, Francisco de Goya, El Greco, and Joaquín Sorolla y Bastida, among others. A major component of this museum is the Sorolla Room which was reinstalled in 2010. It displays the 14 massive paintings, the Visions of Spain, that Sorolla created from 1911 to 1919—commissioned by Archie Huntington. These magnificent paintings ring the large room (estimate: 50 ft square) and depict scenes from each of the provinces of Spain. The rare books library maintains 15,000 books printed before 1700, including a first edition of Don Quijote. ^ Lee, Felicia R. (November 11, 2011). "An Outpost for Old Spain in the Heights". The New York Times. Retrieved 21 April 2013. The Hispanic Society of America is perhaps New York’s most misunderstood institution.